Is the roof on your business more than 20 years old? If so, it has probably exceeded its expected lifespan and will need to be replaced sooner than later. Even if it still appears to be in decent condition, it’s only going to be a matter of time before you will need to replace it, and it’s always better to replace it before it starts showing signs of serious wear and tear. Here are some other signs that will let you know roof replacement is going to need to take place in your near future. Your roof’s materials will tell you all you need to know about it. If they are starting to curl up or fall off, you should probably consider replacing your roof soon. 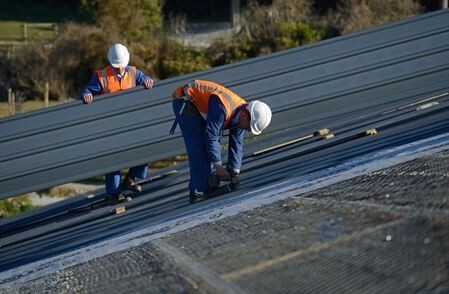 The material is in place to provide protection for your roof, so if they aren’t doing their jobs, the lower levels of your roof are going to start to suffer. There are shingle granules showing up in your gutters more and more often. You should be in the habit of cleaning your gutters out once or twice every year. When you do, take a look in them and see if you can find granules from your gutters in there. It’s not uncommon to find trace amounts of the granules from time to time. However, if you’re finding tons of shingle granules in your gutters, it means your shingles are starting to fail on you. There are signs of leaking. If your roof is not draining properly or if there are crevices allowing water in, the damage could wreak serious havoc on your business, and may necessitate having a new roof installed. Ray Roofing Supply has been providing complete roof tear-offs and roof replacements to businesses for more than half a century now. Call us at 330-452-8109 to get a free estimate on a new roof for your business.